In August of 2000, I was gifted with an unparalleled opportunity to visit some of the most spectacular geography on the planet. 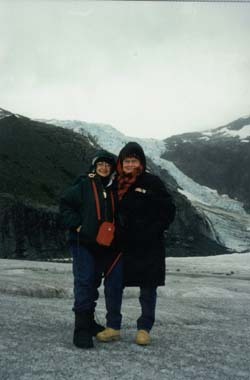 A dear friend invited me to accompany her on a cruise to Alaska. She counts herself a fan, especially of my "Nature Poems," and wanted to expose me to, as they say, "something completely different." (and in this climate "expose" takes on a special meaning.) In these large latitudes, superlatives tend to become as ordinary as punctuation. These pieces are a microscopic slide of the immensity of the experience.